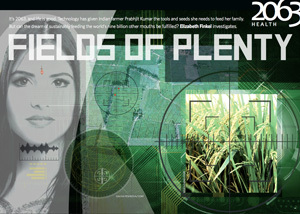 The inaugural Crawford Fund journalism award was won by Elizabeth Finkel with her article ‘Fields of Plenty’ which presents a 2063 vision of agriculture. The article was a feature in Cosmos Science Magazine’s 50th edition in Apr/May 2013. Dr Finkel is Editor-In-Chief of Cosmos Media and author of ‘The Genome Generation’. Dr Finkel’s article recounts the farming practices of an Indian rice growing family using advanced rice varieties and farm-tools that are being developed by the International Rice Research Institute and its partners. The family is imagined by IRRI’s director, Bob Zeigler. The announcement of the win was made at the Crawford Fund’s 2013 Annual Conference in August held in Perth, titled Mining, Agriculture and Development: Bread from Stones?. The prize for the award was a visit to a developing country to experience and report on agricultural research for development projects. The Crawford Fund joined with the Australian Council of Agricultural Journalists to develop the award that aims to encourage working journalists to investigate the important roles that agricultural research, training and rural development play in relation to food security. “What a great first crop for this new national journalism award. The interest was really positive – we had entries from across TV, radio, print and online sources,” reported Denis Blight, the Funds’ Chief Executive. Regional Heat on Biosecurity Review – Roger Hanson, Reporter – Tasmanian Country/Mercury, Davies Brothers Pty Limited.